Science classes are where kids learn the love of asking “why” and “how.” Science teachers, though sometimes a little nutty, are still endearing because they have taught their classes to observe their surroundings and look deeper than the mere surface. If you want to become a high school science teacher, there are things you need to do to accomplish that goal. Going to college is the first step. The next step, and the most important, is to take the right courses. Naturally, you’ll have the required general education classes, but then fill up with science and education classes. You’ll need to take a year each of biology, chemistry, physics, environmental science and any other science class your school requires. Now, this sounds intimidating, but you can pace yourself by taking online courses and graduate without ever having to attend a classroom lecture. There may be some requirements about visiting the campus for labs, but once these classes are completed and you graduate, you’ll be eligible to earn a teaching certificate. In some cases, an Associates degree is sufficient to get teaching certification so you can teach while you complete your other classes for a Bachelor’s degree. 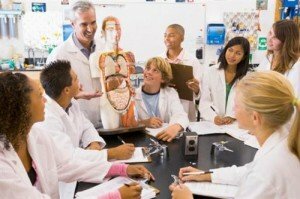 Your degree must have a science emphasis and communicating with your 4-year college choice is wise to make sure the classes you have taken will transfer properly. One can not stress the importance of education enough. Obviously, you recognize the value otherwise you would not be considering becoming a teacher. Higher learning for teachers is strongly encouraged. It may be enough to get your Bachelors degree, but consider the value and quality you will inspire and bring out in your students with your own extended learning. Every state has its own guidelines and requirements of what needs to be taught in the classroom. There are many smart minds evaluating and developing “core standards” that are recommended and passed along to the school districts. But progress is still that. It takes time for places and people to put changes in effect. Most science classes across the country have similar standards, but it is important to know and teach what is expected by the district. Becoming a high school science teacher is a rigorous process. There are exams one must take called the PRAXIS, though some states have their own version, and one must take and pass these tests in order to teach based on the federal requirements for the No Child Left Behind act. Many students have been known to share that their love of science (or any subject, really) was enhanced and nurtured by a special teacher who was passionate about what they taught. Whether it be science, history, art or 18th century literature, all kids are intrigued and will retain far more information from a teacher who loves what they teach. A science teacher, above all other teachers, should love and encourage their students to ask questions. There should be inspiration and learning with every class and ideas for provoking discussion and learning are endless.